Non enveloped, single-shelled T=13 icosahedral symmetry capsid of about 70 nm in diameter, composed of 260 trimers of VP2 that form spikes projecting radially from the capsid. The peptides derived from pre-VP2 C-terminal cleavages remain associated within virion. VP3 forms a ribonucleoprotein complex with the genomic RNA. 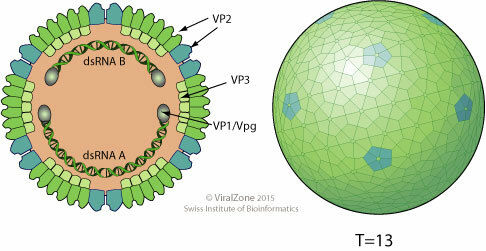 Minor amounts of VP1 are also incorporated in the virion. Segmented linear dsRNA genome: 2 segments (A,B) encode for 5 proteins and 3 to 4 small peptides. VP1 is found in a free form and covalently attached at the 5' genomic RNA end (VPg). Segments size is about 2.7-3 kb. Genome total size is about 6 kb. Genomic segment A encodes for a structural polyprotein which is matured in cis by VP4. It also encodes an alternative ORF translated possibly by leaky scanning (VP5). Genomic segment B encodes for VP1. ASSOCIATED DISEASES IPNV:Infectious pancreatic necrosis in salmonid fish, causes significant losses to the aquaculture industry. Chronic infection in adult, and acute viral disease in young salmonid fish. IPNV induces host cell apoptosis via Bad up-regulation . Also induces caspases activation (caspase-3 and caspase-9) . IPNV would trigger two separate death pathways via upregulation of TNF-alpha, namely the Bad-mediates apoptosis and the Rip1/ROS-mediated secondary necrotic pathway . IPNV:Infectious pancreatic necrosis in salmonid fish, causes significant losses to the aquaculture industry. Chronic infection in adult, and acute viral disease in young salmonid fish.